When I consider how much walking I've done in Manhattan and all the meals I've skipped, I should be in much better shape than I am. Unfortunately, the content of the meals I didn't skip have probably impacted my shape more than those I didn't. 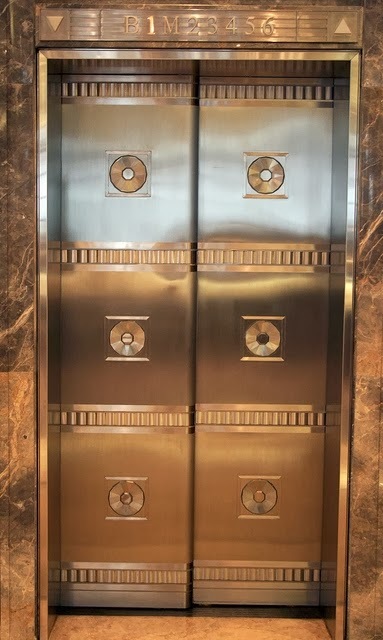 While my daily round trip walking from my hotel to the store is just over a mile, the reality is I covered at least that distance again every day at work just running up and down the stairs traversing the thirteen floors that comprise the Tiffany Flagship store. For better or worse, I can recite the precise number of steps between each floor in each of the store's staircases. The view inside the windowless stairwells never changes, but I walk them because taking the elevator seems lazy and I can’t stand the awkward silence in an elevator full of people who won’t even look at each other. It’s common knowledge that people rarely make eye contact on the streets in Manhattan. It's as if to be caught being looked at is a sign of weakness and to be the looker is a sign of aggression. I proudly take the aggressor side. In Manhattan elevators, people who know each other and who were even carrying on a conversation before they stepped in will go silent and stare at the floor during their ride up or down. Not even on of my famous United Nations-certifiable-weapons-of-mass-destruction-grade-silent-but-deadly farts can get a conversation started and believe me, I’ve tried. People just stare at the floor, hold their breath, and gingerly wipe the tears from their burning eyes. One woman squeezed herself into an already packed elevator and backed herself up right in front of me. Then she turned to me with a semi-snarl and said "You're standing awful close." I was too preoccupied with trying to not breathe down her neck to come up with a witty retort. Manhattan street eye contact notwithstanding, elevator etiquette is even more strange and restrictive. There are several unspoken rules. Do not speak to anyone in the elevator. Do not look at anyone in the elevator. This is a good time to stare at your iPhone. In a crowded elevator, stand in the back so everyone will have to shuffle around to let you out at your floor. Since articulating human speech is out of the question, grunts and hand gestures are acceptable means of communicating that you need to exit. If the doors remain open for more than 1 second after a passenger entrance or exit, frantically push the “close” button. If you realize that you have exited the wrong floor, act as if it was intentional. Do not attempt to re-enter the elevator. This is especially important if you followed optional rule #3 below. Do not hold the elevator door for someone racing towards the elevator. Stare at the floor (or your iPhone) and let the doors close. Don't feel guilty. They'll do it to you. There are probably others, but since I pretty much ignore stupid rules, I've forgotten them. I created a few of my own elevator rules that are great for garnering stares and looks of disgust, fear, and occasional incredulity. At the very least, they create additional space for me in the elevator car as other passengers hit the button for the next floor and bail out, usually with an expression of loosely controlled panic. When the doors open and the car is packed, I invite the people staring into the sardine can to join us saying "Come on in. Two more and it's a party!" In a packed elevator, I announce that the crowd might exceed the elevator's weight limit and if the overload alarm sounds, we should all stand on one leg. Farting is acceptable, not to mention entertaining. SBDs are preferred, but audible poots can be pulled off (or pushed out) in an overcrowded elevator where the blame can be easily passed to another unsuspecting passenger. Turning your head slightly or cutting your eyes towards someone with a "really?!" expression on your face and then looking at others while nodding your head towards the hapless blame target makes for great culpability projecting posture. Singing along to Muzak is permitted; especially if you don't know the words. I personally like inserting the wrong lyrics. I've found that the lyrics to "Welcome to the Jungle" by Guns 'n Roses fit nicely into the melody of Doris Day's "When I fall in Love". Despite my preference for stairwells, I've had to spend an inordinate amount of time in the employee elevators because Tiffany demanded voice wireless LAN coverage inside these cars. This presented real technical and logistical challenges in a 70+ year old building. Fortunately for me, innovative approaches can overcome to such challenges when money is no object, which was pretty much the case on this gig. I love it when a customer tells me that money will never stand in the way of doing something right. I think my attitude on the Manhattan elevator etiquette (farts notwithstanding) has made a positive impact on the store personnel. The last few days I've been on site, when people get on an elevator in which I'm standing, they smile and verbally greet me - usually with a fist bump or handshake. They ignore everyone else who might be in the elevator with me and then pretty much stare at the floor or their iPhone after the greeting, but hey, it's a start!. Now to work on getting back into shape.